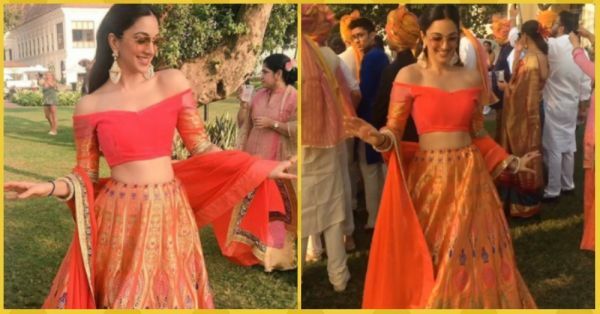 Kiara Advani Dancing On 'Cutiepie' Is Every Desi Girl At A Family Wedding! Kiara Advani has made it to the list of the 'most fashionable celebrities'. Be it the red carpet or a movie premiere, the newbie has been nailing every event with her super stylish appearances. Recently, the actress was spotted attending a family wedding and needless to say, she looked every bit of the fashionista that she is. Kiara donned some of her favourite labels including Manish Malhotra and Papa Don't Preach by Shubhika along with jewellery from one of India's leading fine jewellers Mahesh Notandass at the wedding and her traditional-modern look has definitely left us impressed. "Thankfully my father is not on Instagram or else he'd kill me for putting this up! But I love him toooo much and his dance moves! #DanceLikeNoOnesWatchingYou#mydaddymyhero ❤️"
Kiara is indeed her daddy's little princess and her adorable caption for the video that she shared proves it well. Having said that, we're sure that you are very excited to watch Kiara and her dad show some moves on 'Cutipie'. We bet that every girl will definitely see a little bit of herself in the video... So what are you waiting for? Watch it right now! Kiara Advani and her dad Jagdeep Advani are such cutiepies... Don't you think so?